Commercial ovens are the pillars of any restaurant kitchen and must be kept clean and sanitized with an effective maintenance plan. The problem is that they’re used so aggressively and often, that they’re prone to accumulation of grease, grime, food particles, and other debris. This is not only a health risk, but can also lead to smoke and other hazards like fires. The good news is; it’s easy to prevent any of these issues with a maintenance & cleaning program. Schedule daily oven cleanings for the interior of the oven. Schedule these in the evening so that the oven doors remain open allowing it to air out. Control grease and food particles that are typically left on the oven surface. Making sure to clean these in a timely manner will prevent crusting and hardening that makes future cleanings more difficult. Manage spills and boil-overs immediately. This is another issue that is typically neglected and results in difficult cleanings down the road due to hardening and crusting. Remove racks and wipe down walls and doors with warm water or industrial oven cleaner, like Oven Doctor (KE-108Q). Schedule monthly deep cleanings using industrial oven cleaner, like Oven Doctor (KE-108Q). These deep cleans should cover the interior and exterior of the ovens. 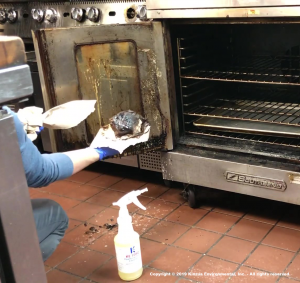 In conclusion, while commercial oven cleaning may not top anyone’s list of favorite things to do, it’s an important part of running a clean and high-performing industrial kitchen.